This past November I had several phrases that stuck in my head. Either from songs I listened to or just something someone said. Two phrases specifically stuck out to me and I decided to draw them out in my sketchbook for my Draw Something Everyday series. It’s a bit of an ironic song in that it paints the life of a party girl in a dark light, while at the same time being a dancing pop song. Her nights are full of fun and oblivion, her days full of shame and the avoidance of real connections. But the powerful chorus celebrates the existential seduction of living in the moment. I’m gonna swing from the Chandelier, I’m gonna live like tomorrow doesn’t exist. When I’m not in the mood to listen to music while I work – a rarity – I like to listen to podcasts. 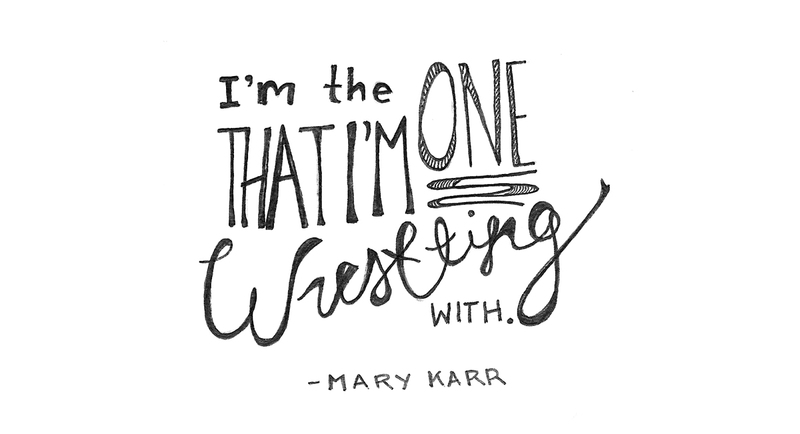 In November I was binge-listening to NPR’s Fresh Air podcast and I came across a Terry Gross interview with writer, Mary Karr. They discussed the process and the ups and downs that occurred as Karr wrote her Memoir. 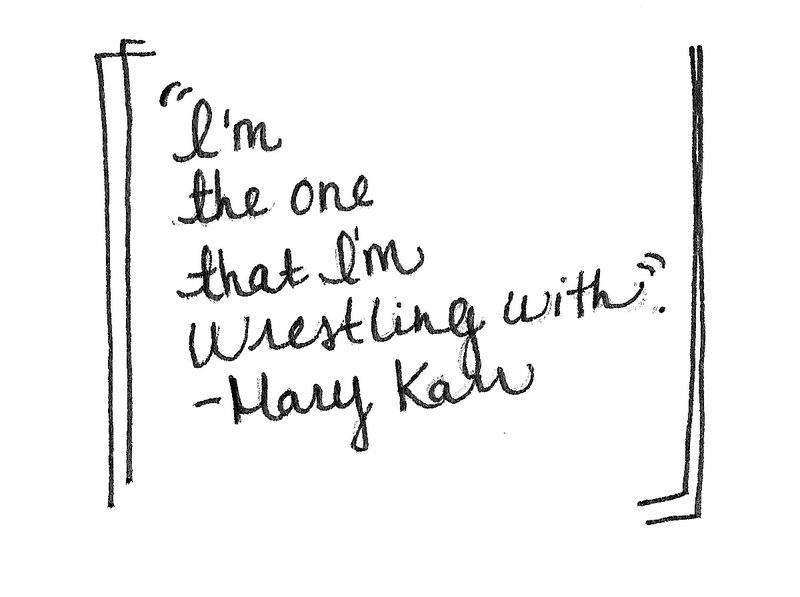 I’m the one that I’m wrestling with. It was such a poignant part of the interview and if you were only half listening you’d miss it. How many times as a creative have I compared myself to those around me? To work I see online? Too many. But the work that comes from me, that gets reworked and worked into, pushed back, and reworked again, that’s the work I’m most proud of. You can’t compare anyone else’s success or failures to your own. They are not the same. The process and journey they took to success does not match yours. When working creatively one must constantly check in with oneself and see what your inner critic says. I drew this phrase over and over again in my sketchbook. It became a bit of a mantra. This phrase strikes a chord with me and my inner philosophy that nothing we create is every really finished.